Rahul Gandhi also said he "felt like hugging" PM Modi whenever he attacked him. 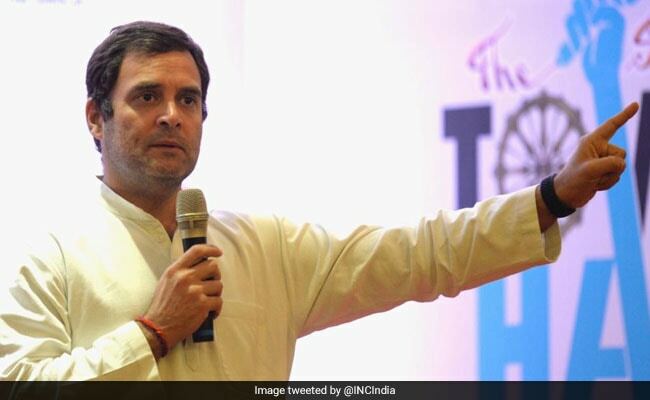 Rahul Gandhi, prone to attacking Prime Minister Narendra Modi almost every day, twice a day, clarified today that he will fight him but doesn't hate him. "I realise he (PM Modi) disagrees with me and I disagree with him, and I will fight him and I will try and make sure that he is not the prime minister but I don't hate him. I give him the right to have his opinion," the Congress president said at the "The Odisha Dialogue" in Bhubaneswar. He also said he "felt like hugging" PM Modi whenever he attacked him. "I look at Mr Modi and when he abuses me, I feel like giving him a hug...," Rahul Gandhi. "He is upset with the Congress party. I understand that also but we are not angry with him. That's our design, we don't hate people." Rahul Gandhi's act of walking across the Lok Sabha to hug the prime minister in July left many stunned and caught PM Modi off guard. The BJP later harped on the Congress president's wink to his colleague Jyotiraditya Scindia right after that hug, which, the party said, betrayed his insincerity. Mr Gandhi also described "abuse" from the BJP and its ideological mentor RSS or Rashtriya Swayamsevak Sangh as the "biggest gift" to him. "The best thing that has happened to me is the abuse that I have got from the BJP and the RSS. This is the biggest gift that they have given to me," he said. Rahul Gandhi said ministries under the Modi government were being controlled by the RSS. The RSS imprint, he said, was evident everywhere in the government and that the outfit wants to penetrate and control all institutions in the country.